Beautifully engraved specimen certificate from the Naturade, Inc. This historic document was printed by the Banknote Corporation of America and has an ornate border around it. This item has the printed signatures of the Company’s President, and Secretary. Naturade, Inc. engages in the development and marketing of branded natural products. The company’s products include low carbohydrate, high protein powders, nutritional supplements, joint health and arthritis pain relief products, and soy protein based powders. Brands and Product Lines Weight loss brands The company offers, Naturade Total Soy, a line of meal replacements for weight loss and cholesterol reduction. These products include shake mix powder products available in various flavors in natural and low carbohydrate formulation, including original Naturade Total Soy powder, Calcium Shake, and Naturade Low Carb Dieters Shake. The company offers a selection of protein booster powders based on alternate protein sources, including Naturade 100% Soy, Naturade Veg, Naturade N-R-G, Naturade 100% Whey, Naturade Soy-Free Veg, and Naturade Milk & Eggwhite. Diet Lean is a new Naturade weight loss brand. Diet Lean offers four different SKUs of dietary supplement plus two meal replacement powders. These products include Diet Lean Body Fat Regulator with CLA, Diet Lean Weight Loss Multivitamin, Diet Lean Fiber Supplement and Diet Lean Low Carb Dieters Shake. Calcium Shake is a soy protein-based meal replacement for weight loss that is positioned to support bone health with the daily value of 1000 mg of Calcium per serving. Soy protein-based products for heart health The company markets 26 different soy protein SKUs that qualify to carry the FDA approved claim that ‘25 grams of soy protein daily, in a diet low in saturated fat and cholesterol, may reduce the risk of heart disease’. Naturade Total Soy is the first soy protein powder brand in the United States to carry this claim on the front of retail package labels. The company offers two soy protein-based nutritional supplement products positioned as energy enhancers, Power Shake and Ribo-tein, plus Naturade Pure Soy, the meal replacement powder made with certified organic ingredients. In addition, three of the six low carbohydrate protein boosters are made with soy protein and carry the FDA heart health claim. Immune system enhancement products The company offers Colostrum Plus line of products. These products utilize bovine Colostrum which is similar to human Colostrum and are reported to improve immune system functions. Other products The company offers additional all-natural brands and product lines, including sports nutrition powders, laxatives, digestive aids, cough/cold products and anti-aging products under the Ageless line. These products are distributed through independent health food stores and natural supermarkets. Markets and Customers The company’s products are sold to the mass market, the health food market and the military in the United States, Canada and selected international markets. The mass market consists of supermarkets, mass merchandisers, club stores and drug stores. The health food market consists of natural food supermarkets and approximately 5,000 independent health food stores. It also provides private label products to its customers. Its major customers include United Natural Foods, Inc.; Tree of Life, Inc.; and Sam’s Club. Competition The company has one significant competitor in the mass market powder sector, including Genisoy from MLO Products, Inc. Its competitors also include Twinlab, Amerifit, Kashi, Balance, EAS, Natrol, Rexall Sundown, Schiff (Weider), and Country Life (Hain). The company also competes with Genisoy and Kashi in the health food segment. In the health food sector, the company competes indirectly with Spiru-tein, a brand from Nature’s Plus, Inc. It also identifies competition from Health Source by Abbott Labs. 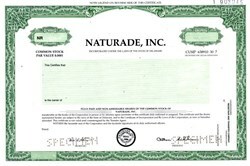 History Naturade, Inc. was incorporated in 1986.